Israel In Prophecy » KeyIssues/Why is it that Jews still reject Jesus as their Messiah today?? Why is it that Jews still reject Jesus as their Messiah today? 14 But their minds were hardened; for until this very day at the reading of the old covenant the same veil remains unlifted, because it is removed in Christ. 16 but whenever a person turns to the Lord, the veil is taken away. 26 and so all Israel will be saved; just as it is written, "THE DELIVERER WILL COME FROM ZION, HE WILL REMOVE UNGODLINESS FROM JACOB. 27 "THIS IS MY COVENANT WITH THEM, WHEN I TAKE AWAY THEIR SINS." 31 so these also now have been disobedient, that because of the mercy shown to you they also may now be shown mercy. 32 For God has shut up all in disobedience so that He may show mercy to all. Our Conclusion: There is a mystery why "a PARTIAL hardening has happened to Israel" but there is a purpose behind that mystery. Missiologically speaking there has been no 'People Movement' (whole groups -not just individuals- turning to Yeshua their Messiah) among the Jews to this point. 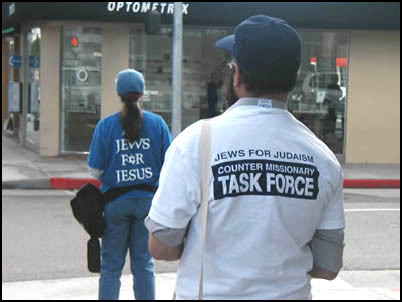 Jewish resistance is probably strengthened by attitudes of superiority among Christians and consequent unwillingness to accept the Jews as their 'older brother' with a special calling; it may also be the consequence of Christian ignorance of the need to make Jews jealous instead of being jealous of them or even condemning them. Christians may want to recognize growing Jewish openness towards Yeshua (Jesus) as the Messiah and to acknowledge the emergence of a messianic-Jewish movement. Part of this recognition could well be what we have called Christian or rather 'Biblical Zionism.' Repentance and reconciliation is the response to this somewhat provocative key-question. If you still don't agree, please read this. If you have comments, please add them below. Read Isajah 1! Isaiah 6! Read Galatians 3! Hebrews 11!Hebrews 4! Romans 4! There is a critical shoatgre of informative articles like this. Stay informtaive, San Diego, yeah boy! If Yeshua stated that he is the water of life, and John the sent one calls him (Yeshua) the living Word, and the Word is Torah, then Yeshua was the Torah in the flesh. As Moses stated "these words are not idle words, they are your LIFE, so choose LIFE". Therefore, anyone who lives the Torah without putting commandments and doctrines of men ahead of it have chosen LIFE, the fountain of living water! Jonathon. The bible say to not say in your heart who will or will not rise into heaven or descend into hell. Therefore, please do not do it. Invariably, there are many Christians who say, "Yes, they will be saved." But the true answer; the Biblical one is a resounding No. A Jew that rejects Jesus cannot be saved. It is the same with a person of any other ethnicity as well. It does not matter who you are, what you have done, where you come from, or if you are black, white, brown or yellow ALL men and women need JESUS. But, surprisingly, many Christians believe that Jews have some special pass. They believe that everyone esle that denies the Lord will not be saved BUT the Jews can deny and still go to heaven. That is false and contradictory. A person of Jewish ancestry needs Jesus, the Messiah, just like anyone else. NO BUTS; NO EXCEPTIONS.